If you drink and smoke cigarettes and you have severe hangover symptoms, you might want to cut down on the number of cigarettes you smoke on the days you drink heavily. The nicotine may be contributing to the intensity of your hangover symptoms. Alcohol drinkers who smoke heavily on the same day they drink heavily are more likely to experience a hangover the next day than those who do not smoke. Those hangover symptoms are likely to be more intense depending on how much you smoked during the day, researchers have found. At the same number of drinks, drinkers who smoked more were likely to have more severe hangovers. A Center for Alcohol and Addiction Studies at Brown University study of 113 college students over an eight-week period examined the effect smoking had on hangover symptoms. The study participants were controlled for other factors, such as past-year drug use. Even when the participants were controlled for age first smoked regularly, the frequency of drug use, type of drug involvement, gender, or smoking status, the results of the study was the same: heavy smoking caused more severe hangover symptoms. For the sake of the study, "heavy drinking" was defined as having five or six beers over the course of an hour, which would result in the students having an estimate blood-alcohol concentration of 0.11. The researchers found that the most intense hangover symptoms were not caused simply because the students smoked more when they drank more. Those who consumed the same number of alcoholic beverages had a more intense hangover if they smoked more. The researchers are not sure why the combination of nicotine and alcohol causes more intense symptoms, but they suspect it is related to how both drugs release dopamine in the brain. Other studies have shown that smoking and drinking at the same time actually boosts the release of dopamine in the brain, so nicotine and alcohol are somehow connected in how they affect the brain, researchers said. Researcher Damaris J. Rohsenow, Ph.D. said the danger in more severe hangovers lies with how a hangover can affect your attention and reaction time. He suggested that those with a bad hangover might not want to drive or work in safety-sensitive occupations while experiencing hangover symptoms. Previous studies have found that smoking can increase the negative effects on the brain caused by long-term heavy alcohol consumption. 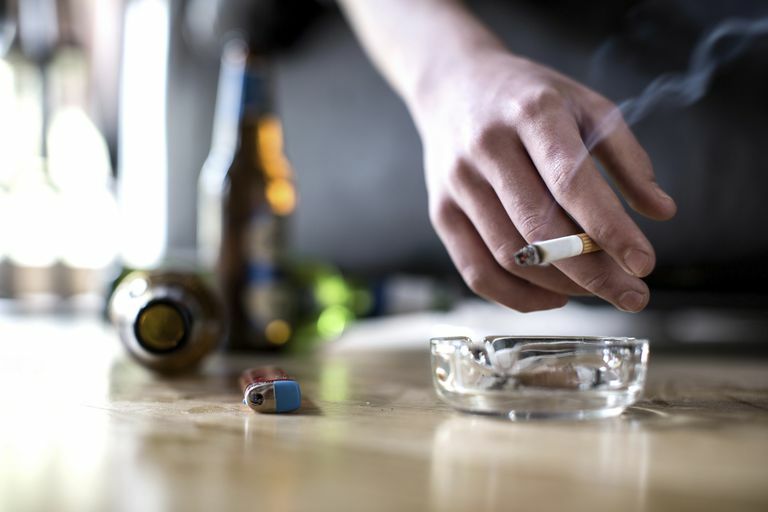 "There are already plenty of reasons to avoid both smoking and heavy drinking," Rohsenow said in a news release, "These findings suggest that if smokers are going to indulge in heavy alcohol use, it would be wise to at least cut down on cigarettes. Jackson, KM, et al. " Role of Tobacco Smoking in Hangover Symptoms Among University Students." Journal of Studies on Alcohol and Drugs January 2013.